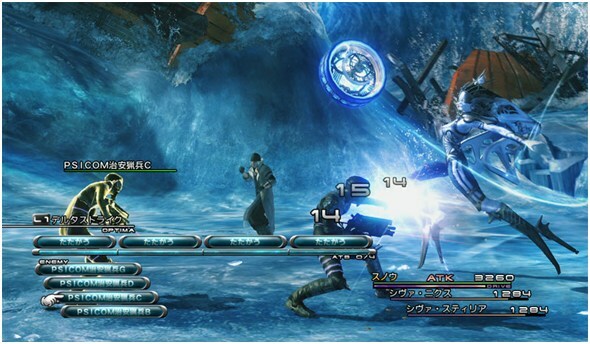 It’s been three years since Final Fantasy XII was released on the PS2 and Square Enix have been teasing us with videos and images of the eagerly awaited Final Fantasy XIII. I’m a massive fan and have every Final Fantasy apart from FFXI as the online mode didn’t really interest me, although saying that, the Final Fantasy XIV trailer looks interesting. So the question people were asking was, just how good Final Fantasy’s first outing as a next gen game would be and would it live up to the hype? Well, it’s different. There was a massive talking point about how linear the game was and some people have said that it isn’t a Final Fantasy game because of it. To some extent I do agree as it is extremely linear and it’s like walking down corridors for 25 hours of the game until you reach Gran Pulse. There are those who love the sandbox style RPG’s which is one of the many reasons why Final Fantasy VII is still probably the best of the series so far. 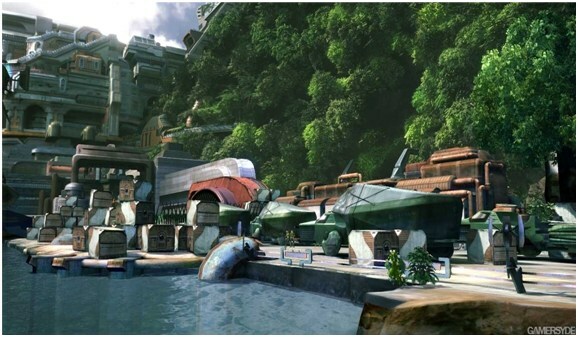 Although some people might prefer this style of Final Fantasy game as they won’t have to trek around open worlds finding clues leading them to their next destination. But surely this is taking away the essence of what a Final Fantasy game is? It’s impossible to get lost in FFXIII as the paths are all laid out for you and item ‘chests’ are incredibly easy to find. You can now choose when you want to fight as all of your enemies are on screen. All you need to do is walk into them to start the fight, or simply walk around them if you can’t be bothered, or feel you’re not strong enough to take them on. The only time you don’t get to choose is for the boss battles. I think Square Enix have gone a bit OTT with the tutorials, as they seem to go on forever but by the end of it you’ll know everything there is to know. Gone are the endless hours of going through towns and speaking to the towns folk, and there’s not a shop in sight. I always found the towns a nice change of pace away from the main storyline where you can upgrade your weapons and magic and find little hidden treasures. You can still upgrade and buy items, but this is all done through the save points and it’s not till later on in the game that you can start to upgrade your weapons. Certain shops are only available to you once you’ve found access keys throughout the game, but they’re not hard to find as they’re usually given to you after certain fights anyway. Right, the storyline…..at first I was like “what the hell is going on here”. But after reading more about what things were in the datalog, which you access from the menu, things started to make more sense, so in later cut-scenes I got what was actually going on and what things were. Basically, a group of people who are led by Lightning, a female soldier, end up crossing paths and they all end up as L’Cie who are enemies of Cocoon, which is the planet they live on, which is above a world called Gran Pulse. The unlikely heroes have to find out what it is they’re meant to do as L’Cie before it’s too late without being killed. I’d try and go further into the story, but honest to God, it would make no sense and I’d go cross-eyed trying to explain it. The battle system has been improved and I would have to say it’s the best one I’ve used so far in a Final Fantasy game. It’s called the Paradigm system and it allows you to swap roles through battles and as the game progresses, it will come in very handy and there’s no way you can advance further without using it. There are 6 roles in all, but only 3 will be available to each character at the beginning of the game, and it’s not till the back end of the game that you can use all 6 roles with your characters. There’s Commando which is for your normal attacks, Ravagers are your magic users, Medics are self explanatory, Sentinel which will draw attention to the player and allow other members to heal, Synergist which will cast magic such as Protect etc, and Saboteur who will cast Slow, and Despell onto your enemies. Each character will have one role that they will be best at but it will be massively helpful to max out the 3 roles you start with and improve the other roles later in the game. Another improvement is that after each battle, all your health will be restored and magic points aren’t even an issue anymore as you don’t have any. Some people might not like this and think that it will take some of the skill away from the battles, but I much preferred it this way. When you die, you no longer go back to where you last saved, which I used to find a real ‘ball-ache’. Now, when you die, you start again near the enemy who just defeated you, so you can either avoid them the next time, or give it another shot. Whilst in fights, each time you hit your enemy, you will fill up their Stagger bar. Once this is full, you’ll have ‘Staggered’ your enemy and all your attacks will inflict more damage. The Stagger bar will drop throughout the fight and you’ll have to do this 3 or 4 times during boss fights to kill them off, but in most fights it will kill off your enemy. The battle system can seem a little complicated at first, but once you get used to it, it’ll come as second nature to you. You’ll also see a bar labelled ‘TP’ under your party leaders health bar, and these are technical points and you’ll get a maximum of 5. These are used to use a couple of magic spells and summon your Ediolon’s which you have to fight to impress throughout the game before they allow you to use them in battle. Each character will get their own but you can only summon them if they’re party leaders, which I thought was a bit of a letdown and you can only summon them once in battle as they cost 3 TP’s each time. 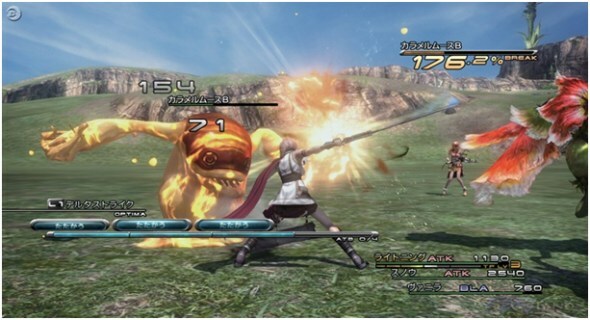 Overall I was very impressed with the new battle system used in Final Fantasy XIII and in my opinion, it’s the best one to date. These are the best in-game graphics that I’ve seen on a PS3 apart from Uncharted 2: Among Thieves, but only just. I still think Uncharted 2 stands out as the best looking game on the PS3 to date as it includes all the finer details and everything is interactive and the depth to the scenery staggering. Don’t get me wrong, FFXIII is breathtaking at times and there’s been plenty of spots where I’ve stopped for a few minutes to just take in the view, but my personal taste leans towards Uncharted 2. But when it comes to cut scenes, they’re just a different class all together. The in-game graphics run extremely smooth and I’ve not noticed any lag throughout gameplay yet. The cut scenes are amazing and it’s just like watching Advent Children on Blu-Ray (if you’ve not seen it, shame on you). The opening scene before the credits really lets you know that what you’re about to see will blow you away and the visuals certainly don’t disappoint. One of my favourite scenes was their descent to Gran Pulse which really made me smile like a great big nerd. Whoever created the scenery and monsters in the game must have some imagination. There’s such a range of weird of awesome looking monsters along the way, it really makes me wonder how they came up with such ideas and if they were smoking something whilst designing them. Simply stunning. 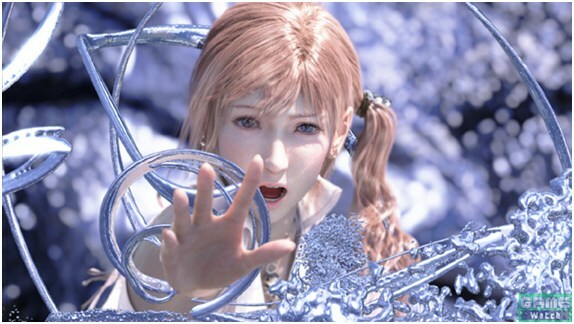 I thought I’d give this a mention as Final Fantasy games are well known for their fantastic scores and FFXIII is one of the best I’ve heard in video games. It’s no victory music from Final Fantasy VII, but it really adds to the mood of the game and can help to add more weight to parts of the game where it’s needed. I’m still not convinced by the theme by Leona Lewis though. The voice acting is well done, but there are certain times where they can get a bit excited over nothing and can make certain parts of the game seem a tad cheesy as is the norm when swapping Japanese voices for American ones. Although saying that there are two Aussie’s in it in Fang and Vanille but the latter can sometimes get on your nerves like nails down a chalk board. 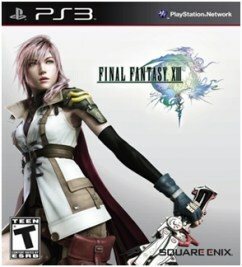 So what did I think to Final Fantasy XIII? It wasn’t what I was expecting but it still left me with the normal joy I get from playing Final Fantasy games. There are a lot of changes that have been made to the game, especially in the battle system but this is definitely for the better. The game is far too linear and it really needed to be like the Final Fantasy’s of old where you have world maps and you can visit towns and play games and do daft side quests. There seems to be way too many cut scenes and you’ll spend just as much time watching them as you do playing the game. But the visuals are that impressive you won’t mind watching some of the best cut scenes ever. It will take you around 50-60 hours to complete, but I think I’ll leave it to mature on my shelf before playing it through again. 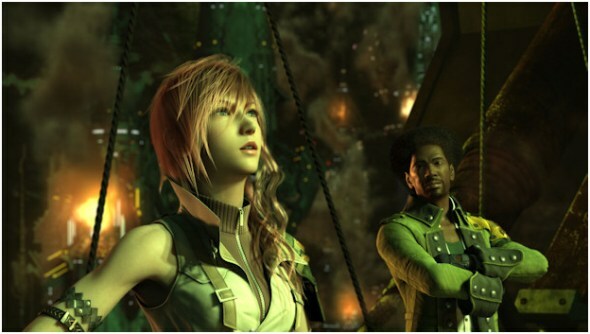 Whether you’re a fan or new to the series, Final Fantasy XIII is definitely one for the collection, but I do think I hyped it up a bit too much and it has left me a tad disappointed, but still a great game.